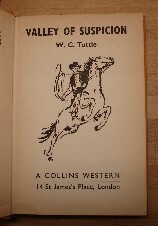 W. C Tuttle is famous for his western novels featuring Hashknife Hartley and Sleepy Stevens (just two of many characters he put down on page). He enjoyed writing (naturally!) and after a long evening's work, would sit back and tell of the things that happened in the old cowtowns and describe the people he had met. Sorry, out of stock, but click image to access prebuilt Amazon search for this title! Storyline: Joe Rich is found by his best man drunk and incapable in the Arapaho bar on the evening of his wedding. The ceremony is accordingly abandoned. Joe resigns his post as sherriff, says good-bye to his intended bride, Peggy Wheeler, and rides off from Pinnacle City. Jim Wheeler, Peggy's father, is subsequently found dead, apparently having slipped from the saddle on a rough track; his money is missing, and Joe was the last person seen in his company. Is his death more than accidental? An unknown horseman, to all appearances a fugitive, blunders into Hashknife and Sleepy, who need no introduction to "Wild West" readers, as they struggle towards shelter in a rainstorm. Who was this mystery rider of the night? Was it Joe Rich? Published in 1948 by the World Publishing Co.
4. "Shot in the Back"
Storyline: Adventure in the West: Those two wandering cowboys Hashknife Hartley and his buddy Sleepy Stevens are surely the most popular characters in all Western fiction. Together they have made Mr. W. C. Tuttle's stories famous the world over. Here they are again, with their humorous wisecracks, their shrewdness and courage, in a grand new story. Storyline: The "trouble trailer" was what Sleepy Stevens called his friend Hashknife in a moment of exasperation. Sleepy wanted-or pretended he wanted - to hurry away from the troubled atmosphere of Bitter River country. But so many strange and tragic things were happening there that Hashknife just couldn't keep his big nose out of the mess. The trail led to trouble enough, and was destined to take these two famous Western characters right into the midst of the struggle between the sheep men and the men on the cattle range. "Got another job for you," Sheriff Humboldt said to his deputy, Art Ingram. "Guess you'll have to ride out to the Slash B and serve another assault-and-battery warrant on Mike Riley. Old man Harper...I guess Riley beat him up pretty bad." "Jess Harper is a good man," Art Ingram said coldly. "Lee Benson and Riley are pushing him and a lot of other old-timers too damned hard, and I don't like it." And that's where this story begins! First published in 1978 in Great Britain by Robert Hale, London, in hardback with dustjacket, 160pp, ISBN 0709166702 . Copyright 1978, Gene Tuttle (W.C. Tuttle's son). Original UK retail price: £3.25 net. Story: Sent to San Miguel in the Lobo Valley to investigate, at the request of the Cattlemen's Association, the murder of a cattle detective who had been on the trail of rustled cattle, one-time range detectives Hashknife Hartley and Sleepy Stevens find themselves embroiled in a whole series of mystery killings. Al Thompson, the cattle detective, has been gunned down by an unmarked bullet; but after that, four seemingly harmless and upright citizens have been killed with bullets marked with numbers: 1 for the first, 2 for the second, and so on up to four. Hashknife pokes around, noting minor yet important details, asking apparently pointless questions and piecing together the bits of the jigsaw. There seem at first to be many pieces missing. But at last Hashknife and Sleepy have the whole picture complete.